The mission of the Litigation Section is to promote excellence in all areas affecting dispute resolution, including the protection of the rights of all litigants, pre-trial discovery, the expeditious trial of lawsuits, alternative dispute resolution, effective judicial administration, uniform rules of court, and the protection and preservation of the independence of a judiciary of high quality. To make recommendations to the State Bar Board of Trustees. Established in 1983, the Litigation Section is a voluntary membership association for attorneys and affiliates who share an interest in litigation. The section is led by a fifteen-member Executive Committee comprised of attorneys from across the state and by a distinguished panel of advisors who are prominent attorneys and state and federal judges. The Litigation Section provides high quality education programs, including Best Practices and Coaching for the New Practitioner seminars and webinars on various topics of interest to litigators. We publish California Litigation three times annually, presenting articles on major trends in litigation, and also publish California Litigation Review, an annual journal summarizing important caselaw developments. The Section also analyzes and comments on proposed legislation affecting the practice of litigation and on proposed new or amended California Rules of Court and CACI jury instructions. 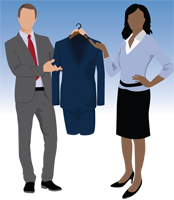 The Litigation Section of the California Lawyers Association announces the Seventeenth Annual Law Suits™ Statewide Clothing Drive. From July 1 to July 31, drop off your gently used business suits (men’s or women’s) at any Men’s Wearhouse® in California. Shirts and blouses, slacks and skirts, ties, belts and shoes, in good condition, are also urgently needed. All clothing will be donated to Working Wardrobes for a New Start® and other nonprofit organizations dedicated to helping adults in crisis get back to work. You will receive a receipt for your donation and a coupon for 50% off the regular price of all items on your next Men’s Wearhouse® purchase, excluding Exceptional Value and custom items, shoes, and clearance. To locate the Men’s Wearhouse® nearest you, call 1-800-776-7848 or visit www.menswearhouse.com. If you have additional questions, contact the Law Suits™ Program Committee Chair, Norman J. Rodich. For a list of the former Chairs of the Litigation Section since its founding in 1983, see Past Chairs of the Litigation Section.